I grew up surfing in Southern California. After a wild season of high school and parties, I left for the Hawaiian Islands in 1965 (every surfers dream). In Hawaii I began using drugs, which went from bad to worse, a little to a lot. I had burned a hole in my stomach from using daily and nearly died at the age of 20. Only by the powerful grace of God, that gave me enough wisdom to stop using synthetic drugs. So I began to take pride in using only "top quality" organic drugs (what a lie). At the hight of my deception while living near San Francisco (1968), I met Cindy, my wife to be. We fell in love and moved back to the Islands, this time Maui. While living with some local surfers in Kahana Maui, little did we know our lives were about to be invaded by the power of God's Love and Forgiveness. Through a convicting letter from Cindy's mon, who had recently had a renewal experience and was now on fire for God, gave Cindy the Good News about forgiveness of sin. As Cindy read the letter the Holy Spirit spoke to her about sin and how she was hurting Jesus, she repented, asked for forgiveness and cried for days. We then moved to Hana Maui and there we got married. Little did we know God was drawing us to Himself and to be apart of a revival called the "Jesus Movement" that began in the 60's. Meanwhile, Cindy was growing in her faith and she became very evangelistic and told all my friends about the love of Jesus and the forgiveness of sin. At the same time, I'm still a stone head and thinking, how did I end up living with Billy Graham? After one hard year of marriage, my life was becoming a total bummer. Even though I lived in one of the most beautiful places on the earth and had a perfect living situation with plenty of money, I was not happy. No peace, no contentment. So we moved to Southern California where I grew up. On May 7th 1970, after a Bible study (I was invited to by a young man with a big Afro hairstyle and a lot of peace and joy in his life), I found myself on my knees, asking God to forgive me of sin. And for the very first time, I experienced real love, real peace, and real forgiveness. Christ then brought out His big bolt cutters and cut the chains from my heart and freed me from a long time drug habit, and immoral life style, instantly gone! WOW! More of God's Great Grace! Oh! By the way, all those friends of mine that Cindy shared Christ with became Christians. Thank You Jesus! Do it again Lord, in our day and in our time make your deeds known. After sitting in the pews for two years, I met a group called Gospel Outreach. It was with G.O. I learned to be a "Disciple" (a wholehearted follower of Christ). We had a passion to save the lost and train the saved. After 18 years with G.O. Ministries, with the blessing I moved back to Hawaii. This time the Garden Island of Kauai with no plans to start a Church. After a couple of years, my wife and I began teaching a small home group and the rest is history. We now have seven awesome grand children. Our oldest son Jeremy works with Youth With A Mission in Norway and is married to Eileen and they have three great kids. Our daughter Leah is married to Jason Brown and they are youth leaders at Kapa'a Missionary Church on the Eastside of Kauai and doing a great job. 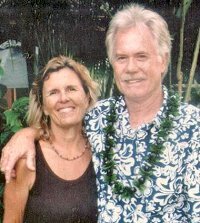 Our youngest son Nathan is Married to Lila Girl and they are part owners of Kauai Surf School. Nathan also does worship music for Jason and Leah's youth group and other worship gatherings around the island. Lila Girl teaches youth Hip Hop dance, a great outreach to the youth on Kauai.